Speaking at a press conference held to celebrate the day at the Simon Bolivar room at the Embassy of Venezuela, OAS representative in St. Vincent and the Grenadines Melene Glynn stated that the main objective of the day is to stimulate new initiatives to establish programmes of action dedicated to involving women fully and completely in their countriesâ development. Glynn stating that the election of several women Presidents in Argentina, Brazil and Costa Rica and a woman Prime Minister in Trinidad and Tobago is a milestone in the history of democracy in the hemisphere, but there is still a long way to go, as women represent 22.7 percent of parliamentarians in the hemisphere. Minister of National Mobilization Frederick Stephenson, making brief remarks at the conference, stated that the day presented a good opportunity to redouble efforts to ensure that women have equal opportunities and that they are equally respected. âUnfortunately, in too many parts of our hemisphere and beyond, women are still denied rights and deprived of dignity,â he stated. 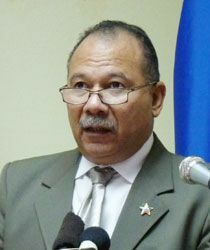 Frederick stated that the Government of St. Vincent and the Grenadines will continue to place women on the forefront of its developmental thrust. He added that over the years, Vincentian women have not only benefited in many areas, but have made significant progress in decision making positions. Frederick made note of the appointment of the Honourable Girlyn Miguel as the first female Deputy Prime Minister in St. Vincent and the Grenadines. Commending the work of the Gender Affairs department and the National Womenâs Council (NCW), Stephenson stated that the Government supports the efforts to increase the protection of women. He added that the government is setting up facilities to deal with sexual and gender based violence. He also mentioned the setting up of a crisis centre which will act as a safe house for battered women and young girls. Also giving remarks, Ambassador of Venezuela Yoel Perez Marcano stated that the Bolivarian republic seeks to highlight the importance of women in different countries. Marcano, saluting the efforts of the several organizations committed to womenâs rights in St. Vincent and the Grenadines, stated that the rights of women should be promoted, adding that the presence of women in social and political areas is important. Also giving brief remarks, Silma Mclean, 2nd Vice President of the National Council of Women, highlighted that in too many parts of our hemisphere, women are still being deprived of rights and dignity and are still being marginalized. She added that there needs to be an increase in public awareness of the obstacles that still face women and the ways to promote equality among genders.